What Tree Do Acorns Grow On? Acorns come in many varieties and grow throughout the United States. Unlike apples, which grow on apple trees, or walnuts, which grow on walnut trees, acorns do not share the name of the tree on which they grow. Though sometimes referred to mistakenly as an "acorn tree," the tree that produces acorns is the oak. Different oaks produce acorns of different shapes and sizes, making a tree's acorns a helpful tool when identifying an oak species. Several species of oak (Quercus) live in the United States. Naturalists divide oaks into three broad groups, classifying individual species as red oak, black oak or white oak. In general, oak trees are tall, with many species growing to heights of up to 100 feet. They have true end buds, which means the bud lies on the end of a twig, and produce acorns. Naturalists use the leaves, bark, buds, twigs and fruit characteristics of a tree to identify its species. The acorn is the fruit of the tree and is where you'll find oak tree seeds. The seeds sometimes land on fertile soil near the parent tree. The seeds are also carried off and planted (buried) by squirrels who sometimes forget where they've left them. An acorn is essentially an oak tree nut. Like other nut trees, each species of oak produces its own unique acorn, and individual acorn characteristics differ depending on species of oak. In general, red oak acorns have flat and saucer-shaped caps with overlapping scales, black oak acorn caps are bowl-shaped and shaggy and white oaks bear acorns that have bumpy, bowl-shaped caps. Acorns vary widely from species to species within these broad categories. 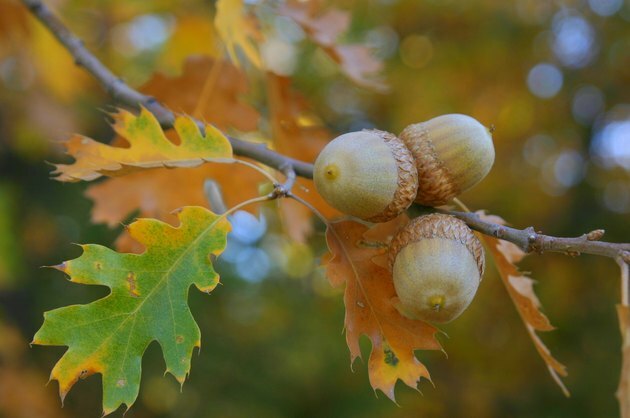 Acorns of the northern red oak, for instance, are less than an inch in length and egg-shaped, while acorns of the sawtooth oak, also a red oak, are larger, measuring more than an inch in diameter, with unusual caps with scales that grow long and curl. Many wildlife species depend on acorns for food. Deer, mice, wild pigs, blue jays and woodpeckers feed on the fruits once they drop to the ground. During years when acorns are scarce, these animals will find other food sources. Some animal species, however, depend entirely on acorns for their survival. Acorn woodpeckers, for instance, rely solely on acorns and will migrate to another area should the nuts become unavailable. Acorns have served as a source of food for humans for thousands of years. They were a staple of many Native American tribes in Northern America. Many species of oaks produce acorns that are edible raw. Acorn leaching, a process that leaches tannins from the nuts using hot water, decreases bitterness and makes the nuts easier to digest. Acorns can be ground into meal for use in breads and stews or processed into oil. Cyn Reed has been writing since 1992 on a number of topics, including gardening, wine, food and animals. Her work has appeared in such publications as "Clifton" magazine, "Calliope" and the "Georgetown Review." She is currently working on a book about the oldest trees in the world. Reed has a Bachelor of Arts in English and a Master of Fine Arts in writing. When Do Pecan Trees Produce Nuts?